Euro 2008 kicks off in 2 weeks with Switzerland taking on the Czech Republic at St Jakob Park on Saturday 7 June 2008. It promises to be a cracking event, not only for the football on display but for the picturesque backdrop it will be played in. The biggest arena in Switzerland, St Jakob Park was built in 1998 to replace the St Jakob Stadium, which hosted the 1954 World Cup Final between West Germany and Hungary. 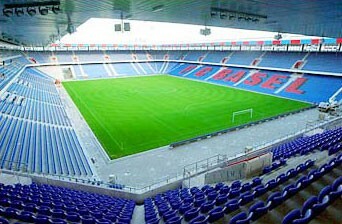 In 2006, the ground witnessed one of the worst cases of hooliganism in Swiss history when FC Basel and FC Zurich fans fought on the pitch after a championship decider. 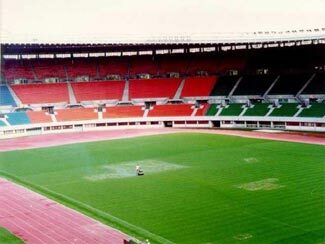 The capacity of the stadium has been increased from 38,500 to 42,500 for these finals, and it will host a total of six matches, including the first match between Switzerland and the Czech Republic, as well as the opening ceremony. 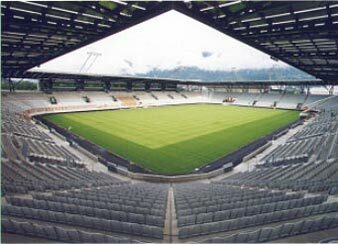 The home ground of Young Boys Bern has a single red seat which was the first installed in the ground. It is not possible to buy tickets for the seat — it is instead occupied by a notable personality each game. Wankdorf is a relatively new stadium, having been built in 2004. 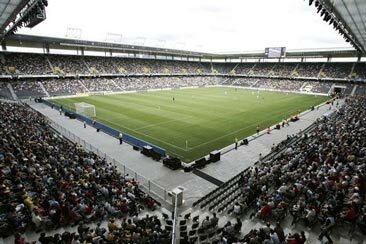 It opened in January 2005 with a friendly between Young Boys and Olympique Marseille and has a capacity of 32,000. With Geneva the home of FIFA, it is not surprising that the Stade De Genève was selected as one of the host venues. With a capacity of just 30,084, it will be the smallest stadium used at the finals this summer, although it boasts some pretty spectacular views. 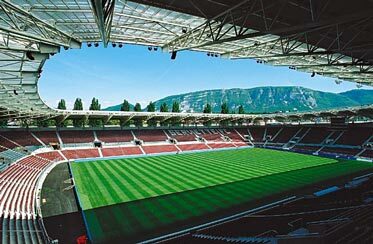 The Stade De Genève is the home of the fallen giants of Swiss football, Servette, who were declared bankrupt in 2005 and have only just been promoted back to the Swiss equivalent of the Championship. English fans will remember the stadium as it hosted the friendly match between England and Argentina in December 2005. The stadium has been the home of FC Zurich since 1925, but it is also the current home of the more famous Grasshoppers, who are using the venue while they have a new stadium built. It also doubles up as Switzerland’s premier athletics stadium, hosting the annual Weltklasse athletics meeting, which is part of the International Amateur Athletics Federation’s annual roster of events. In 2000, Tina Turner sold out the stadium on two nights during her Twenty Four Seven Tour. The biggest stadium being used in Euro 2008 with 53,000 seats and the venue for the final. 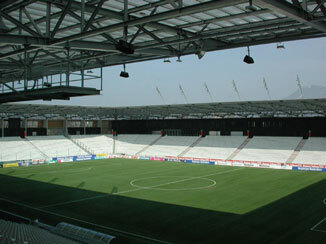 The Ernst Happel is the national stadium of Austria. It is not home to any Austrian clubs, although it does regularly host bigger home matches for Rapid Vienna and Austria Vienna, whose own grounds are smaller. It has hosted four European Cup finals, as well as Manchester City’s sole European success – their 2-1 win against Gornik Zabrze in the 1970 European Cup Winners Cup Final. The stadium will host all three of Austria’s group matches, two quarterfinals, one semifinal and the final. One of the stranger venue choices as it is a town with a population of just 90,000. Germany will play two of their games in the town and there are question marks about whether the infrastructure can cope. The town’s football club, SK Austria KÃ¤rnten, was founded in 2007 after taking over the franchise of ASKÃ– Pasching, who had been one of the less distinguished members of the Austrian Bundesliga. Hypo-Arena has a capacity of 32,000, though this is to be reduced to 12,500 after the tournament has finished. Salzburg is famous for being the birthplace of Mozart and the setting for much of “The Sound Of Music” but it made headlines in 2005 for footballing reasons. Soft drinks company Red Bull purchased Casino Salzburg, changing the club’s name and landing itself in hot water for trying to claim that “this is a new club with no history”. The old Casino club had won three Austrian Bundesligas and contested the 1994 UEFA Cup final, which they lost to Internazionale. 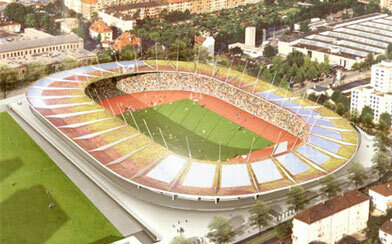 The Stadion Wals-Siezenheim has been expanded from 18,000 to 31,000 for the finals. It has a plastic pitch, although it will be replaced with grass for the duration of the tournament. Yet another new stadium that has been expanded for the tournament, it is something of an anomaly because Austria, despite their poor recent form, have actually won a game at the ground, beating the Ivory Coast 3-2 there in October 2007. The stadium is home to FC Wacker Triol, another new club, founded after the bankruptcy of one of Austrian football’s better known names, FC Tirol Innsbruck, which collapsed in 2002. Not the most impressive group of stadiums but you probably won’t see too many stadiums that are not full for every match. would be brilliant to see if England won the rights to 2018 so we could see the emirates, old trafford, stanley park and Wembley play host to such a massive event. or spain. I think the stadia will all be fine for Euro 2008. If not, everyone can laugh at the name of the Swiss National Stadium instead. Urmm.. I think a fact-file type would be better with all the facts listed and then a breif review and a bigger pic. Still okay to see them all here though..
other than that, yea, I wanted to do detailed profiles and put up more pics for each stadium but this format is a bit simpler and a lot easier to manage.